HHR alum Nancy Morriseau, left, with Patrice Jean at the first HALANY Honors Awards Ceremony. 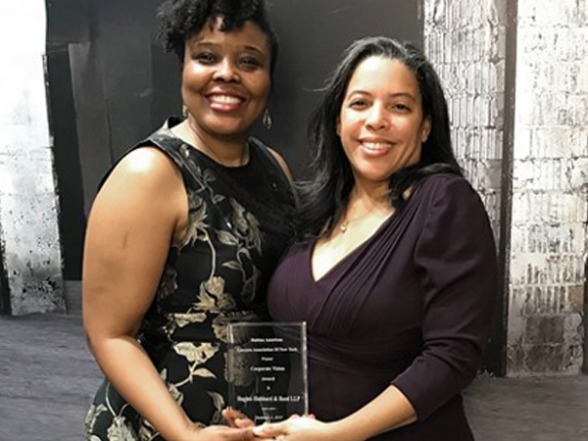 Hughes Hubbard received the "Corporate Vision Award" from the Haitian American Lawyers Association of New York (HALANY) in recognition of its pro bono work on behalf of the Haitian community. Patrice Jean accepted the award on behalf of the firm at the first HALANY Honors Awards Ceremony, held in Brooklyn on Dec. 2. HHR alum Nancy Morriseau presented the award. HHR has assisted HALANY on a pro bono basis since 2013. In collaboration with the International Senior Lawyers Project, HHR reviewed comparative international land reform programs to assess whether such land reforms could work in Haiti. The firm also provided attorneys to assist eligible Haitian nationals apply for temporary immigration status immediately after the 2010 earthquake and continues to help Haitian immigrants in a variety of immigration matters. HALANY was founded to promote and encourage participation by Haitian Americans and other ethnic minorities in the judicial and legal system.